If you’re looking for an inexpensive lunch with lots of variety, check out Masa and their 3 items for $10 combo lunch deal. 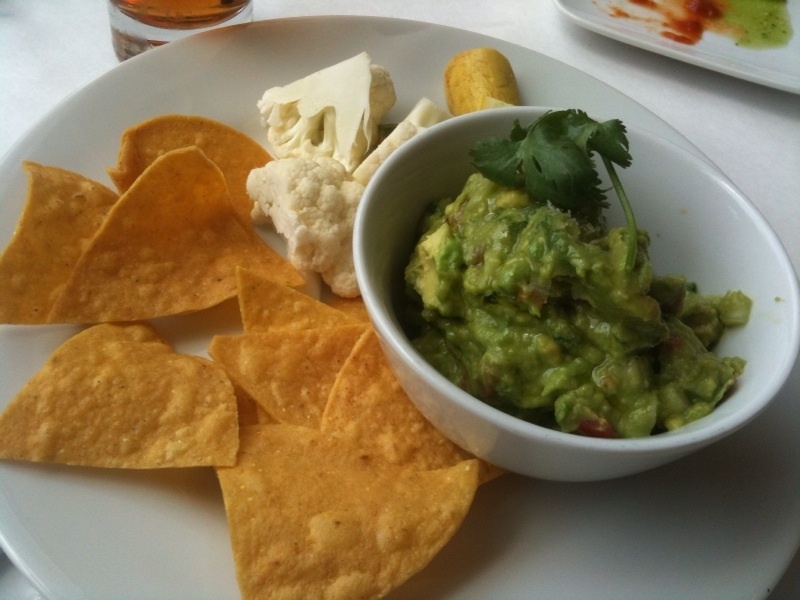 I liked that the guacamole came with raw veggies, not just chips, but I wasn’t a fan of the texture. It’s prepared mashed-style, which just isn’t my jam. Also, we noticed it didn’t have a strong avocado flavor, and the guac looked like there was olive oil mixed into it. We wondered if perhaps the chef added olive oil to try to compensate for under-ripe avocados? 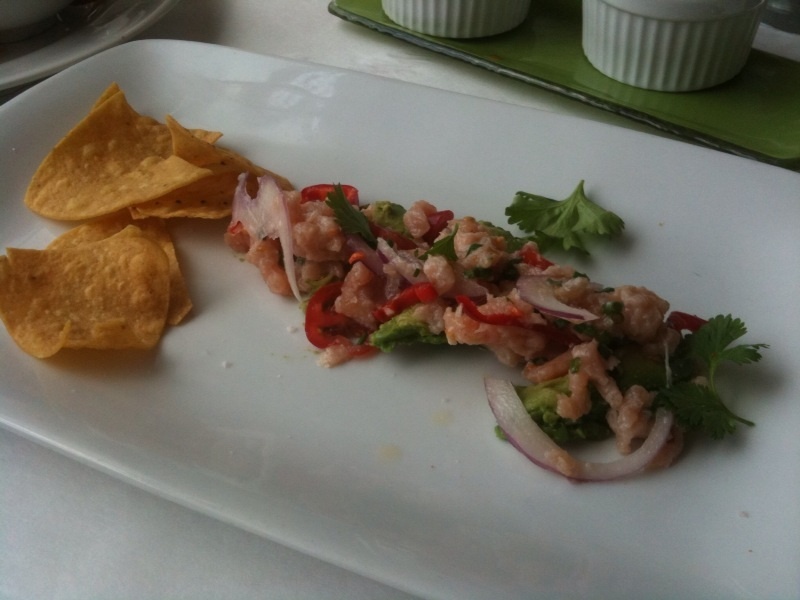 The ceviche was fantastic. Good flavor, good subtle heat. But, as you can see, even for an appetizer-sized portion, we didn’t get a whole lot. This was the only dish where we felt like we didn’t get a great value. 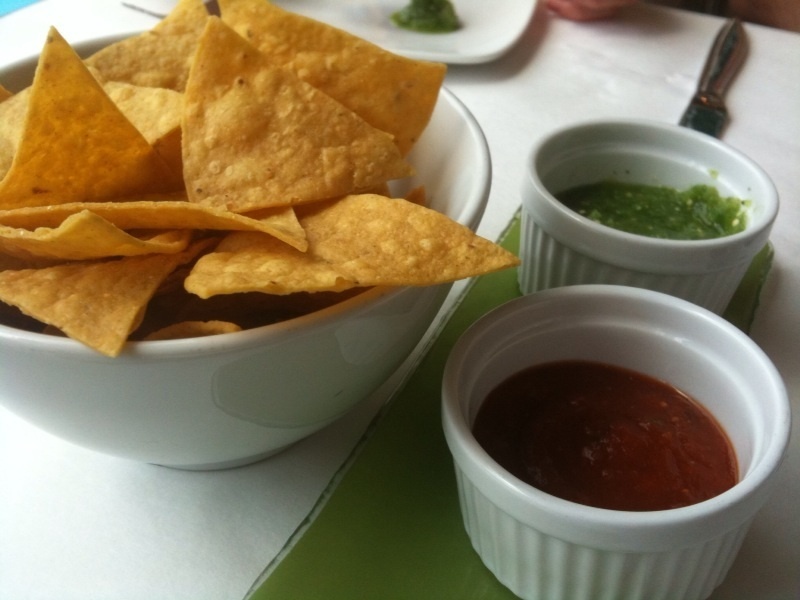 The best pre-meal nibbler that we had were the complementary chips and two salsas that were brought for the table. The salsas had great flavor and the chips were freshly made and extra crispy. I especially liked the Salsa Verde. It was really fresh with great cilantro flavor. We ordered a variety of entrees and ended up doing a bit of pass the plate sharing. I went with the Camarones al Mojo de Ajo ($15). Wow, was it good. 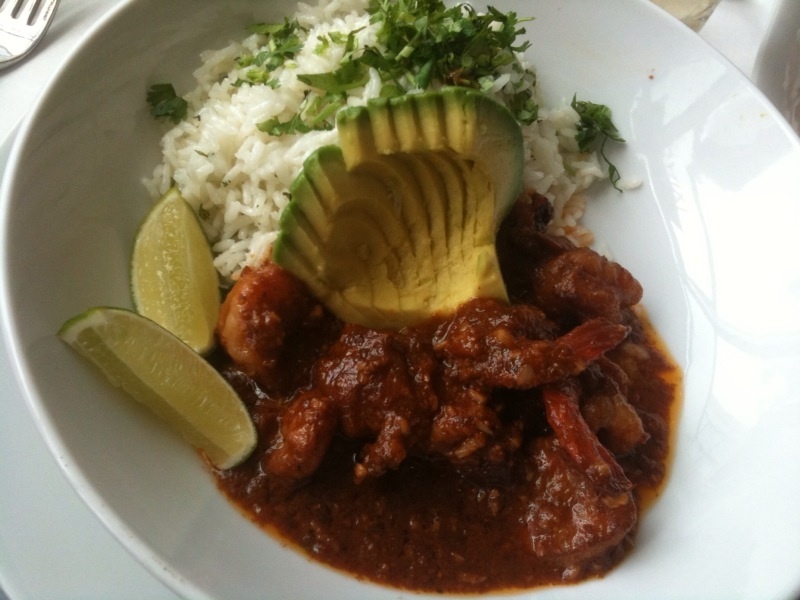 The dish had a generous portion of sautéed Florida gulf shrimp which were toasted in garlic, chipotle in adobo and lime for huge smokey, tart flavor. On the side was really tender cilantro rice–the perfect compliment–and beautifully sliced avocado, which, contrary to our guac, was perfectly ripe. Our table agreed that this is definitely a dish you shouldn’t pass up when you come to Masa. Another group favorite was Chilaquiles Rojos con Chorizo ($12)–Two fried eggs you can get prepared way served with chips that have been simmered in Guajillo salsa, then topped with onion, queso fresco and chorizo picante. The rich creaminess of the egg yolk was really delicious with the salty chips. If I had one complaint about this dish it was that the texture was too uniform. 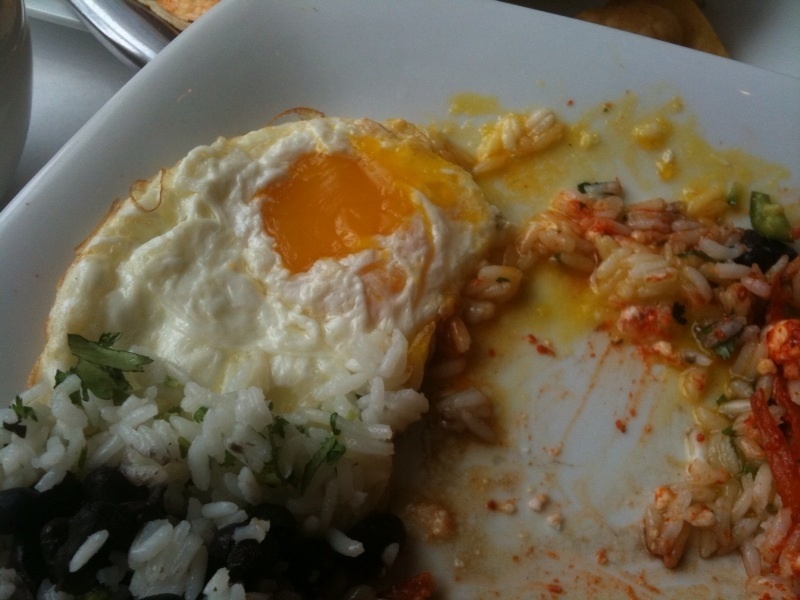 The delicate softness of the eggs and yolk would have been even better if they could be sopped up with something a bit crustier–the chips were a little too mushy for me. 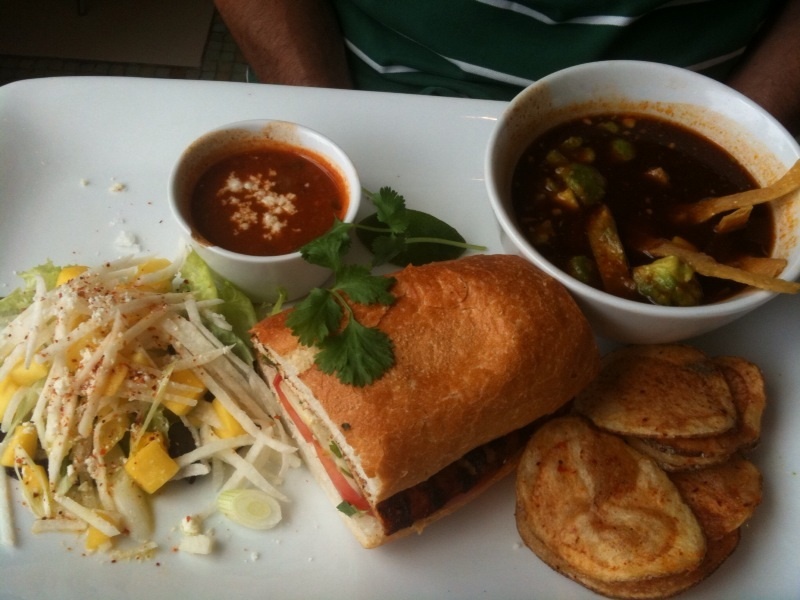 And here’s combo number two: Mango and Jicama salad, a Grilled Chicken Sandwich, and a Chicken Tortilla soup. 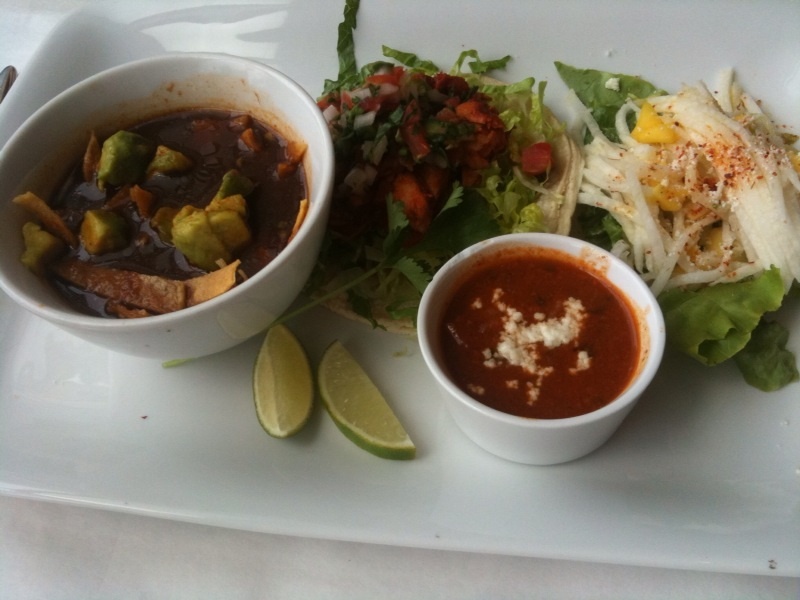 The group was very impressed with the components of the two combo dishes–the Chicken Tortilla Soup in particular was a big hit. It has lots of cilantro and a really rich broth. The Mango Jicama salad was also a table favorite. We liked the crunchiness of it, and with a little lime squeezed on top it was the perfectly sweet-tart and refreshing salad. Finally, the smartest diner at our table ordered dessert for lunch: Crepes de Cajeta ($6.50). I heard they were delicious (they disappeared before I had the chance to try a bite!). 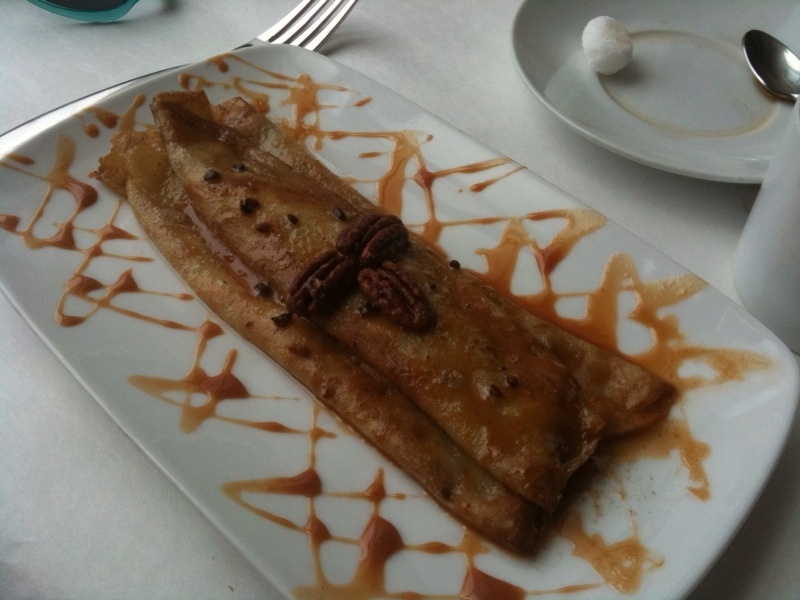 When I’m at Masa next I’ll definitely be trying these buttered crepes slathered and drizzled in caramel made from goat’s milk and then finished with candied pecans. 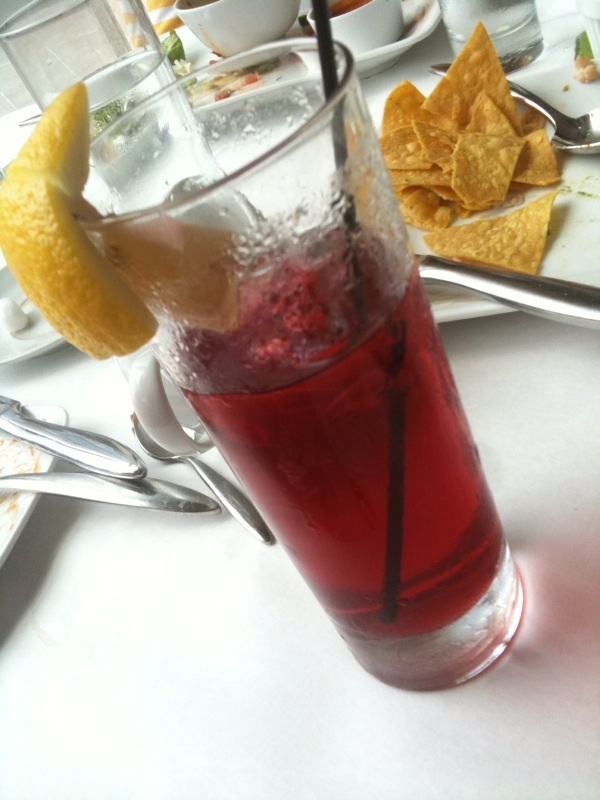 Drink: Be sure to try Masa’s Té de Jamaica–Hibiscus Iced Tea ($2.25)–it’s cool and refreshing and not too sugary. Service: I wasn’t a big fan of Masa’s service. When we needed someone, our waitress was nowhere to be seen. Then, while we were still enjoying our meals, a large aggressive team of servers came and tried to take all the plates from our table. Our water glasses were never refilled once. Scene: The dining room was packed the lunch-hour rush, so I was glad we had 12:30 reservations (you can reserve a table through Open Table). 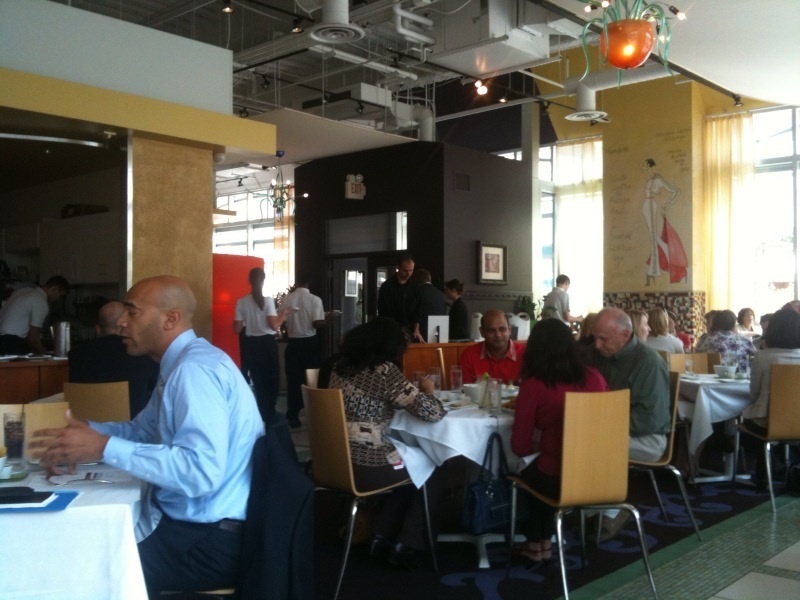 It was hard to spot a group of “civilians” eating–it was clear that nearly everyone in the dining room was a business professional out for lunch–and we saw a ton of Target cards. Not surprising, since their corporate headquarters are right around the corner from Masa. 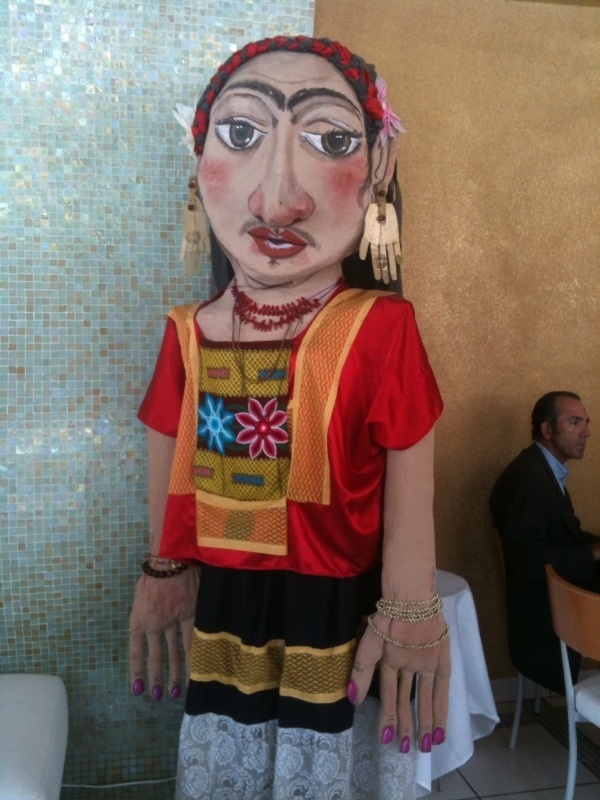 This larger than life Seniora welcomes diners as they enter Masa's lobby. During the week you’re likely to be surrounded by business casual or business professional wear, so don’t dress like a complete slob unless you want to stand out. Cost: You can get away with a $13 tab here if you go with Masa’s 3 for $10 combo option. For a larger lunch your tab will be between $17-22.